I recently came back to my motherland after a short service in "La Legion Etrangere" and some experience as a builder and construction worker in the UK. I fell in love with nature and Namibia all over again! I started working on a project of building a campsite for Journeys Namibia and soon I found out that I was nominated as a scholar for the Amarula Trust Scholarship Program. I was the first student on duty and took everyone out into the reserve in the game viewer. We left the camp at 06:00 and I thought I would have to cut my fingers from the steering wheel because of the freezing cold! Luckily it wasn’t long before the sun broke over the horizon and we were greeted by a confusion of bird calls. The morning drive was eventful and we circled the north eastern part of the reserve. On the afternoon drive we headed for Kudu dam. We had a lion sighting and it was my first ever, I was so excited! Unfortunately they had two young juveniles already, so we were too late to see “storro storro”. We had many great sightings – hippos, blue wildebeest, crocodiles, African wildcat, gemsbok, kudu, giraffe, an eland carcass (killed by a male lion the previous day) ground squirrel, waterbuck, impala, springbok, black wildebeest and lots of birds, including a pale chanting goshawk. And don’t forget the lions! 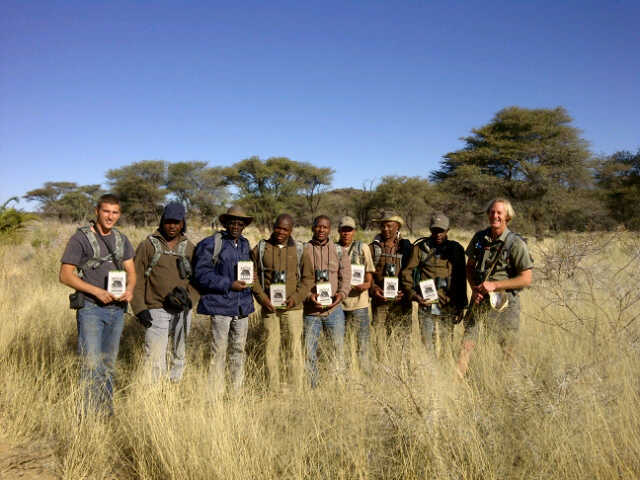 There were also lessons to be learned on the drive (from instructor Ralph Kirsten) – how to identify black rhino signs by looking at its dung and the sexual dimorphism of different antelope. I am looking forward to the rest of the course and also coming back for my Level 2! Who is following EcoTraining's blog? Win a birding trip to Kruger National park. EcoTraining Blog. Awesome Inc. theme. Powered by Blogger.